Maruti Suzuki has silently revealed the price of the 2019 Balneo RS facelift on its website, prior to the car's official launch. 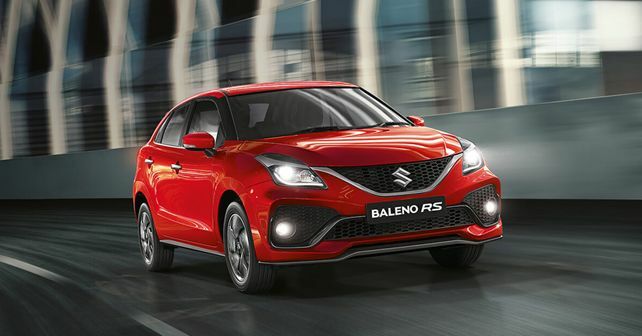 Unlike the 2019 Baleno facelift, Maruti Suzuki seems to have opted for a different launch strategy for the 2019 Belano RS facelift. Ahead of the car's official launch, Maruti has unveiled the price of the 2019 Baleno RS facelift, which is priced at ₹ 8.76 lakh (ex-showroom, Delhi). Like the regular Baleno model, the Baleno RS facelift receives a redesigned front fascia which features a new grille and a sporty bumper design. While the regular car gets a 3D-design grille, the Baleno RS makes use of a honeycomb grille design all over the front fascia. The air dam on the bumper is now bigger, flanked by fog-lamps on either side and the bumper is supported by a spoiler on its lower lip. While the front styling is confirmed owing to the only available picture on the Nexa website, we are yet to see if there have been any changes at the rear of the car. The side profile, meanwhile, seems to be unchanged with the exception of new alloy wheels, which have been lifted from the standard Baleno. Under the bonnet, however, things have been left unchanged as the new car carries over the previous powerplant - the 100bhp, 998cc three-cylinder Booster-jet motor. The engine continues to be mated to a 5-speed manual gearbox (although an automatic transmission would have been a welcome addition) and unlike the standard Baleno which gets only front disc brakes, the Baleno RS comes equipped with disc brakes on all four wheels, as standard. In terms of features and equipment, the Baleno RS is equipped much like the Baleno's top-spec Alpha variant as it gets Maruti's new Smartplay Studio Infotainment system, auto climate control, keyless entry, LED projector headlamps with DRLs and many other convenience and safety features. As before, the Baleno RS continues to compete against the likes of the Volkswagen Polo GT TSI and the new boy Tata Tiago JTP. While we do not have a confirmed launch date at the moment, it will continue to be sold at Maruti's Nexa dealerships.